Born: November 21, 1928, Samut Prakan, Thailand. 1983 - Exhibition of Art Since 1932 at Thammasat University. 44 Pagodas in Siam, Muang Boran Publishing House. Plu Luang is written for History, Documentary and Astrology. First used in "Siam Samai Journal"
Lum Charoen Sattha is written for Ancient Art Criticism. 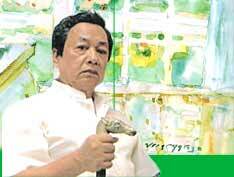 First used in "Sangkhom Sat Parithat Journal"
Kawel Chanalbun is written for short story and used in painting signatures. First used in "Siam Rat Sapada Vichan Journal"
S.P. Fisher is written for art Criticism. First used in "Sangkhom Sat Parithat Journal"
O Sathi is written for Astrology. First used in Weekly "Khun Ying"
Nai Senior is written "Silpakorn University Publications". First used in Freshy Welcome of the University.